It’s true. I do engage in bizarre breakfast habits. Served along with fried or scrambled farm fresh eggs, sauteed kale is on the top of my list as are fresh greens dressed with a little olive oil and vinegar. When certain veggies are in season, I tend to eat them any time of the day and dare not declare them a “lunch or dinner only” feature. In honor of my German heritage–specifically the rich and flavorful memories of my great-grandmother and grandmother cooking cabbage a dozen different ways–and the 10-day celebration that concluded last weekend in New Braunfels, I have been having my own Wurstfest at home for the past two weeks consuming copious amounts of sauteed cabbage. Perhaps you recall two years ago when I ate my weight in faux sauerkraut–the recipe for which I begged and pleaded a chef in New Braunfels to give (gift) me? While I am a fan of sauerkraut, this cabbage I have been eating (and eating) isn’t just any sauteed cabbage, though the simple kind with a pat of butter does make my heart go pitter-patter. This dish is taken to the height of flavor by first crisping up diced pancetta–the Italian version of bacon. Rolled with an inner layer of freshly ground black peppercorns, pancetta adds an amazing depth of flavor to plain cabbage and dresses it up so it seems more like something you’d find in a German pub. The combination of the softly wilted cabbage and the crisp and salty pancetta is heavenly. Though you might not be inclined to devour a bowl of this for breakfast, I do encourage you to serve it up as a side with some grilled meat. Served with sausage and crispy pan-fried potatoes would complete the German feast. This recipe requires a fresh head of cabbage, preferably organic, and a thick chunk of the best pancetta you can find. You could replace the pancetta with bacon, but please use an applewood smoked slab bacon that is nice and thick. 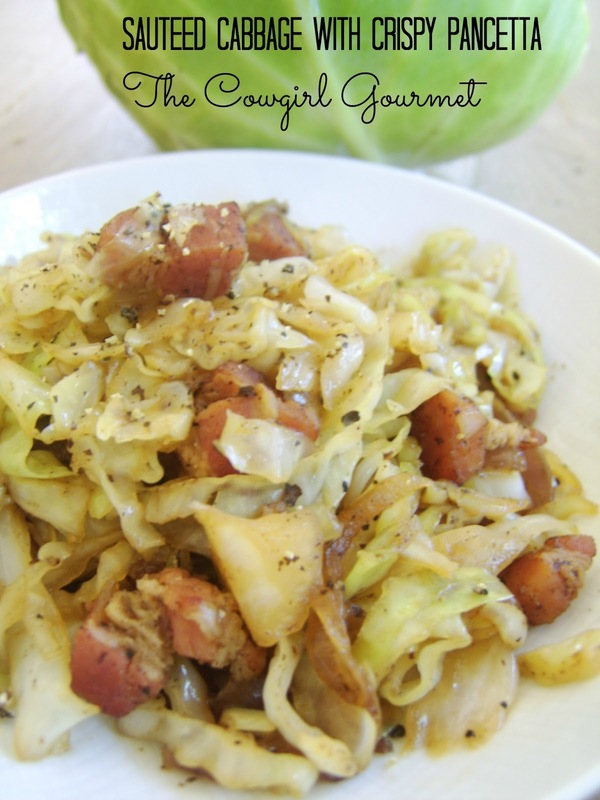 The beauty of this dish is when you get a mouthful of the chunky, crispy pork offset by the soft, almost sweet sauteed cabbage and onions. In a saute pan over medium high heat, add the olive oil. Then add the diced pancetta and let cook. Stir occasionally, turning the chunks so they get crispy on all sides. This will take about 10 minutes. Once the pancetta is starting to get caramelized and crispy, add the onions, a bit of salt and toss to combine. Let the onions cook about 5 minutes, stirring well. With the crispy pancetta and softened onions, next add 2-3 tablespoons of water to deglaze the pan, stirring well to lift up all of the crispy bits on the bottom. Now add the thinly sliced cabbage, another few pinches of salt and stir to coat. The water in the bottom of the pan will help wilt the cabbage but will evaporate before the cabbage is cooked. If needed, add a little more water or oil in the pan. Continue to stir the cabbage so that it all melds nicely and cooks evenly. Saute the cabbage until it's wilted to your liking. Add freshly ground black pepper and stir to combine. Taste the cabbage and adjust the seasoning if needed.